"Someone approaches. You will not fail us, son of Kass." I was just in time to hear the Faerie utter the words before The Three turned on the spot and vanished. Westron turned. He caught sight of me. I was torn, should I confront him? Or run for it? Westron was my best friend and I needed to know what on Neopia was going on. So I strode up to him. "Not here, Rae," he whispered, before I could utter a word. "At the tavern." Back in Westron's dismal room, I sat trying to make sense of everything. He had explained that The Three had been visiting his dreams for a while now. He had brought me to the Citadel on this particular trip because he had hoped that I would be able to help him face them. However, he had felt the presence of The Three as soon as we had arrived at the tavern the previous evening, and their power had prevented him from explaining this to me at that time. As soon as I had gone to my room, they had appeared before him. He explained that they had instructed him to leave me behind at the tavern, and meet Lord Darigan alone. There he was to overpower him and take charge of the Citadel. "But, I don’t understand, why didn’t you make it to Lord Darigan's chambers?" I asked him. "When I was on my way there, I suddenly came to my senses, I went back to the tavern to look for you and to take you with me," he told me, "but when I got back you were gone. I went to look for you, and that’s when Vex found me and brought me before Lord Darigan." I could see that he deeply regretted allowing The Three to influence him so, but I couldn’t understand, why they seemed under the impression, that he was still going to fulfill their wishes. He explained to me that he had hatched a plan, a plan to defeat The Three once and for all. He would continue the ruse that he was doing their bidding, so that he could reconvene with me and ask for my help. "We need to tell Lord Darigan," I said at once. "He is the only one who can help us." "I thought you might say that," Westron replied. "The thing is, if I tell Lord Darigan, that The Three are back and that they influenced me, then he is going to think I want to finish my father's work. He already doesn't trust me as it is." "Okay, so we need to think of something else. I think the best thing to do is to head back to Meridell and have a look in the library, see if we can come up with some way of defeating them, without Lord Darigan's help." "I have a plan already, but it's going to be difficult, not to mention dangerous." Westron grimaced. "Knowing that The Three would likely accost me on this trip to the Citadel, I got Balthazar to show me how to trap Faeries in a bottle, he could only spare two, but I think we might be able to get the Skeith and the Gelert in one and the Faerie in the other." It was the best plan we had, and it sort of made sense, I mean, if the bottles could contain the power of a single Faerie, then it stood to reason that Neopets, being weaker could be trapped together. "What we need, is a way to trick The Three, into enough complacency, that we can trap them before they know what is happening." Westron said. I absentmindedly scratched my chin as I thought. The only thing I could think of was too risky. But I couldn’t see any way around it, we were going to have to involve Lord Darigan one way or another. I posed this idea to Westron, I could see his mind ticking over as he also tried to think of a way around it. "I really don't want to involve him if I can help it," he told me, "if it goes badly I'll never be allowed back in the Citadel." I couldn’t understand why he was so keen to come back here in the first place, from what I had seen it wasn't exactly a fun place to be. Westron's personality just didn’t fit in here. I knew it was his homeland, but other than that I couldn’t understand why he would even want to be here. None of his family were here. They'd all moved on with their lives, why was he so stuck in the past? "Look," I started, "I know how important this is to you, to prove that you aren't like your father, redeem your family name and win back the approval of Lord Darigan, but I honestly don’t think that he will ever fully trust you. Honestly, I think you are wasting your time. I think you'd be better to avenge you father by imprisoning The Three. And then, y'now, just, move on with your life." I winced a little as I waited for his response. There was a loud sigh, "I guess you're right," Westron conceded. "I just, want so badly, to prove that I'm, I dunno, that I'm a good person." "You are a good person. You've proved that already. Look, I understand that you want to shake off the shackles of being your father's son, but you can't. Even if you prove to everyone who knows you, how unlike your father you truly are, there always be those who don't know you, and nothing you could ever do will convince everyone. You will always be 'the son of Lord Kass' nothing you can do will ever change that, and you need to learn to live with that." "Oh Janurae, how did you get to be so clever?" He asked me. "I've wasted so many years trying to prove to Lord Darigan that I am worthy of his trust. And for what? Nothing. You're right, I'll never be able to move on from this if I keep crawling back, for an approval I'm never going to get, from someone who in the grand scheme of things means nothing to me. 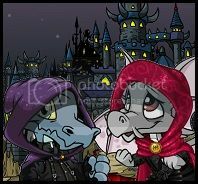 You are such a good friend to me, it is much more important that I have Neopets in my life like you, who care about me and don’t force me to work for their approval." I hugged him. "It's okay," I told him, "sometimes all we need is a little perspective." He smiled at me. Took a deep cleansing breath. "So, tell me this plan of yours then." It was the dead of night, the cover of darkness was our ally. We made our way through the narrow, twisty streets of the Citadel toward Lord Darigan's chambers. Ducking into shadows whenever we heard voices or footsteps. It was imperative that nobody saw us, after all, Lord Darigan had demanded that we leave the Citadel more than half a day ago. If anyone were to spot us, I dread to think what might happen. I pulled the hood of my cloak further down over my head so my face was in shadow. Lord Darigan's chambers loomed in front of us, eerily silent in the depth of the night. A single light was on in what I assumed were his private quarters. Westron pointed silently to the light, I nodded. This was where we needed to go. Westron lead the way up the path, I followed his footsteps. He ducked into the shadows suddenly as a guard appeared around a corner, as luck would have it the guard was pointing his torch in a different direction as I too ducked into the shadow cast by a parapet. He didn’t see us. I allowed myself to breathe a sigh of relief. Westron crept silently toward the wooden door that was the entrance to the chambers. It was tall and made from weathered oak, with big bulky metal hinges, each with giant spikes jutting out. He twisted the handle and we snuck inside. The hallway looked so different in the darkness. Each of the portraits on the wall was underlit by a single candle, which flickered as we swept past. The edges of the weapons below each portrait glinted threateningly in the candlelight. Westron set off purposefully toward Lord Darigan's private quarters, I dipped my head and followed, trying not to catch the gaze of any of the portraits, as if by making eye contact with them would alert someone to our illicit presence. There was a single guard lazing in a wooden chair outside Lord Darigan's solar. I could see the relief on Westron's face, we had anticipated the room to be more heavily guarded, a single guard shouldn’t cause us too much trouble. As Westron readied himself to launch the Thick Smoke Bomb he had brought as a distraction, another guard appeared. We waited with baited breath to see what would happen. The second guard muttered something in a voice so low I could not make it out. The first guard stood, and as luck would have it, followed the second one off into the depths of another corridor. It was now or never. Westron double checked the coast was clear, headed over to the door and gave it a strong push. The door swung open with surprising gusto. He beckoned me to follow, then disappeared into the room beyond.